This poem was written by Douglas Dunn in 1979. 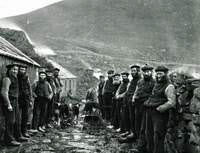 Inspired by a photograph of the St Kilda parliament taken in 1879 it represents the point of view of the photographer, but also reveals awareness of the abandonment of St Kilda fifty years later. Above all it conveys the way of life of the people of St Kilda and attempts to enter their minds to understand their perception of the tourists visiting their islands. Go to the Guardian website for a profile of Douglas Dunn. Five years ago, and have discussed them since. If she were told of the populous mainland. By a history of these northern waters. Fish, and whatever morsel he grows here. Of weather in the eyes like landmarks. And footprints stratified beneath the lichen. Playfully clutching the edge of a boulder. The moody jailer of the wild Atlantic. Hierarchies of cuisine and literacy. This flick of time I shuttered on a face. Look at their sly, assuring mockery. Designs of affluence and education. Of a sullenly managed boat from the future. Affection scattered across my own eyes. It is to this island that I return.